Since admitting that meal plans do, in fact, make life approximately three thousand times easier, I have attempted to incorporate regular planning into my weekends. I feel a little itchy and anxious if Monday dawns and that section of my planner is empty. I remain a calendaring luddite, unwilling to budge from my tried and true day planners. No digital planning for me, thank you very much. I use a calendar that has the week on the left-hand page and a notes section on the right-hand page. I divide that left-hand in half, and use the right column for meal planning and food-related tasks. 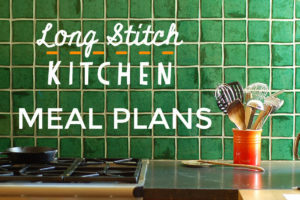 It works brilliantly, and because I have been diligently meal planning for several years, and keep all my old planners, I have several years of meal plans that work for my family. Pretty genius, no? Except I hardly ever refer back to them, because I like tackling new recipes most weeks. But I like knowing they are there. We get a fruit and vegetable box delivered every Monday evening (currently from Imperfect Produce), and they send the list of contents late in the week. This gives me the information I need for Sunday meal planning. My older kiddo participates in the World’s Greatest After School Activity on Wednesdays – dinner club, when they prep a whole meal that we then bring home and eat up. I usually make a little something to go with it, especially if we are having company, but it is pretty great to get that break in the middle of the week. Anyway! Since I go to all this trouble, it seems only natural that I start sharing my weekly meal plans on here. I’m never totally devoted to the plan, and often end up throwing out half the meals or moving them around, but it sure does make life easier to have a scaffold for our dinner week. I’ll add in links when I’ve tracked down recipes off the web, and will include any cookbook references as well.